@COVER:@COVER introduces its A1Cover Outdoor TV Flap Top Cover ,Scratch Resistant liner protect LED Screen best-Compatible with Standard Mounts and Stands (Fits 55" TV Set, Black). 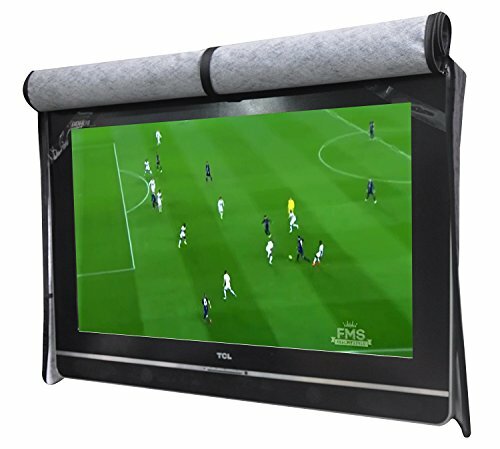 Why Try Our outdoor TV cover by a1cover? ※HIGH EXCELLENT QUALITY MATERIAL:100% Waterproof Material:400D Heavy Duty Polyester and Artificial cotton liner,The Artificial cotton liner is completely protected TV Screen,Do not hesitate,Quickly ADD TO Card. ※NEW DESIGN OF BOTTOM SEAL -360 degrees protection, The BOTTOM VELCRO can provide the maximum coverage against water. The Velcro inside is designed to prevent the water from leaking into the back. ※Extremely Easy to Open and Close Front Slap,Circle the magic stick,Scratch Resistant Cotton Liner to Protect Your TV Screen. ※Whether it be Wind, Rain, Snow, Dust, or Mold and Mildew, Our Universal Cover will protect your TV year round. ※ Waterproof remote Controller storage pocket. ※Fit most mounts and stands. ※Extend the life of outdoor TV. ※Unconditional 2 YEARS Warranty with no questions asked. ※Fast and easy-to-reach Customer Service to solve your problems within 24 hours. We guarantee satisfaction that if you're not happy, send it back new or used for a full refund within 90 days. We also offer the longest 2 years warranty. HIGH EXCELLENT QUALITY MATERIAL:100% Waterproof Material:400D Heavy Duty Polyester and Artificial cotton liner,The Artificial cotton liner is completely protected TV Screen,Do not hesitate,Quickly ADD TO Card. NEW DESIGN OF BOTTOM SEAL -360 degrees protection, The BOTTOM VELCRO can provide the maximum coverage against water. The Velcro inside is designed to prevent the water from leaking into the back,The REMOTE CONTROL POCKET facilitate storage of your remote control. TWO YEARS WARRANTY:We guarantee satisfaction that if you're not happy, send it back new or used for a full refund within 90 days. We also offer the longest 24 month warranty. If you have any questions about this product by a1cover, contact us by completing and submitting the form below. If you are looking for a specif part number, please include it with your message.